How To Create Your Own Amazon Web Stores In A Breeze! Did you ever wonder how you could monetize Amazon Products for your own Profit and rake in commissions on autopilot? Well, I recently tried a bit on my Amazon Account and finally it was very easy. The first thing you need to do is to get your own Associates Amazon Account. Next click the button “aStore” in your Dashboard. You can have up to 100 aStores per Associate account. Click the “Add an aStore” button to create a new aStore or click the “Edit” button to update an existing aStore. Click the “Use This Template” button to create an aStore using a pre-configured template. You can then customize aStore’s content and settings any way you like. Chose a unique ID for your store. Amazon will tell you whether your choice is available or make a proposition you can use too. Try a little bit using your fantasy to find a compelling and unique store ID. Then customize your Amazon Store with the tools given and add the products, categories and themes you would like to display. When done, click on the left side bar of your Amazon Dashboard at “aStore Widget” to customize the widget to promote your products from your store on any website you want. With aStore widgets, you can display products from your aStore. You can add aStore widgets to various pages of your website and drive traffic to your aStore. Use the Build Links tool to select the appearance and behaviour of the widget, and then simply cut-and-paste the code into your template or Web page. Your page will now display aStore widget. The 9 to 5 Giveaway Is A Full Success! You can grab any one of the valuable products on the page for FREE. And you don’t have to look through page after page of junk downloads, because these products are all carefully selected, and they’re all right there on one page! This book will show you what you need to do to turn your online website and business into a resource that your customers can trust. You’ll also learn how to get more customers to visit your website. How to design your website so that you attract the customers you want. How to reach your customers through e-mail marketing. Why co-branding is important. How to choose online partners that are right for you. How to create customized content for you website so that your customers visit frequently. How to establish yourself as an expert in your specific industry. Well, please head over to IMCrashCourse.com now. Dig in and let me know your comments. This is really great stuff and you get also the IMCrashCourse Newsletter in your mailbox soon. Today I have an awesome free download for you that will help you get traffic and make more affiliate sales. Please make sure you save it to your hard drive! * And ALL the Methods are Free! I have profited so much from these methods that I decided to let you, my best readers and ubscribers participate and profit too, all for free! 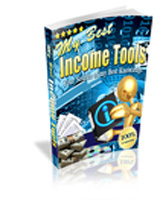 Just my gift to you – to help you with your affiliate marketing. And if you want to get your hands on more so useful reports and affiliate products to promote, then check these Cash Kits here! Enjoy and to your best success! Do you want to change any of your Pictures and Graphics? Maybe you know already that there is a free and very useful software tool called GIMP. It’s a proven and secure open source program which you can directly download for free from the GIMP Homepage. GIMP provides all the same tools as Adobe PhotoShop but will cost you absolutely nothing to use! They offer a detailed manual and if you are patient enough, you can learn all the tricks and what to do with GIM from there. However, if you are like me, your time is valuable and you want to have results fast and in easy to follow steps, then you should take advantage of this great opportunity. I want to introduce you to a series of 27 video tutorials that will teach you everything you need to get started with the GIMP open source software. One thing is sure: After this video course, you will never need outsourcing your graphic designs. You will be shown step-by-step how you to can use the free Gimp software – and you’ll be generating professional, high quality graphics and designs in no time! When you’ve completed the tutorial on ‘How to Create Web 2.0 Graphics’, you’ll have progressed to making incredible graphics and awesome effects. In fact you shouldn’t be surprised if others think you are a professional graphic designer! So if you are ready to see how these videos can help you to start using this exciting free software today, please go here. A real saver on financial resources and time. You will really stand out with these graphics like a professional. Take the chance now and see the Videos! …but building a sustainable online business is even harder. Well, not quite, if you know the secrets. Recently there was a discussion about the secrets of building a sustainable online business, one that can pay you every month, months after months. If you missed this discussion, check it out now!